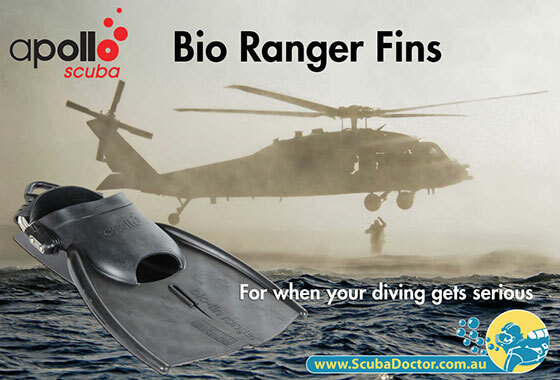 The Apollo Bio Ranger XT Fins are tough, light and compact military split fins that are suitable for long and short distance water operations, including counter terrorism, tactical operations, mine counter measures, search and rescue, and battle damage repair. 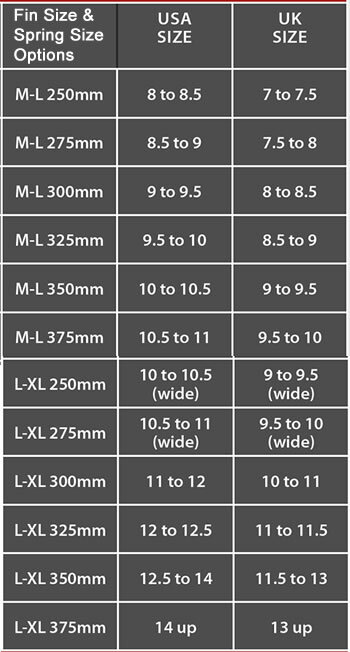 Their size and low weight means that they are also suitable for helicopter and parachute insertions. Great for recreational and technical divers wanting to step it up a bit. Divers prefer Apollo's natural rubber material as it is negatively buoyant. If the user is required to discard the fins when in the water, they will sink to the bottom and therefore not alert others the diver's presence. Similarly, the flexibility of the rubber gives powerful thrust, while reducing the risk of surface splashing. The comfortable foot pocket accommodates most military and amphibious footwear, for example jungle boots. Owing to the anti-slip high traction sole, the Apollo Bio Ranger fins are also easy to walk in. The Apollo Bio Ranger fins are available in two sizes: Medium/Large and Large/X-Large. Each fin size is available with your choice of four different stainless steel spring strap lengths: 250 mm, 275 mm, 300 mm and 325 mm.